Documentation: Description: Lake Ogallala, Keith Co, 25 Apr 2007 (Brogie 2008). Record: One was discovered by Charles Brown, Valerie O’Brien, and Sarah Knutie roosting with six Turkey Vultures at Lake Ogallala 25 Apr 2007 (Brogie 2008). It was watched both in flight with the vultures and perched. It could not be re-located 28 Apr (Mark Brogie, personal communication). Intriguingly, one roosted for a night at Jumbo Reservoir, northeast Colorado, about 60 miles from Keith Co, Nebraska, in late Apr 2007 (Gary Zeeto, personal communication); it may have been the same bird that appeared in Nebraska. Comments: The nearest regular range is northeastern New Mexico, where it is migratory, arriving in spring in Mar (Johnson et al 2000). eBird shows three records for Colorado 27 Apr 2002 Boulder Co, 17 Jul 1999 Mesa Co, and 6 Aug 2002 Boulder Co but the Colorado Bird Records Committee does not include the Aug 2002 record. It is generally not prone to wandering, although it has occurred in Louisiana and even Nova Scotia (Johnson et al 2000). 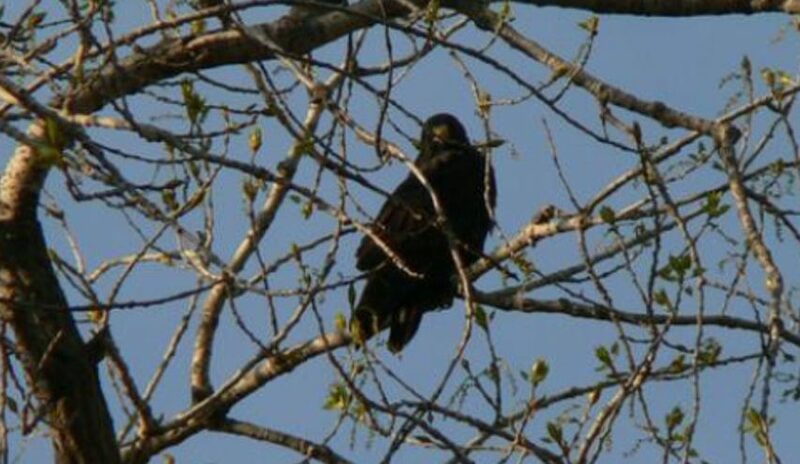 Photograph (top) of a Zone-tailed Hawk at Lake Ogallala, Keith Co, 25 Apr 2007 by Sarah Knutie. Johnson, R.R., R L. Glinski, and S.W. Matteson. 2000. Zone-tailed Hawk (Buteo albonotatus), version 2.0. In The Birds of North America (A. F. Poole and F. B. Gill, Editors). Cornell Lab of Ornithology, Ithaca, NY, USA. https://doi.org/10.2173/bna.529.